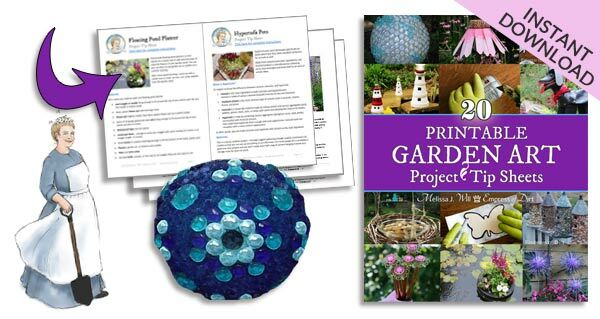 Want to save money in the garden? These tips come from experienced gardeners sharing how keeping focused on the big picture can help you avoid wasting money on short-term distractions that keep you from having your dream garden. Been there, wasted that! You can also save money with these tips for improving your garden without spending a dime. Do as I say, not as I’ve done! Don’t worry—this isn’t a lecture! It’s just a simple list of things you might want to look out for, so you can make the most of your garden budget. 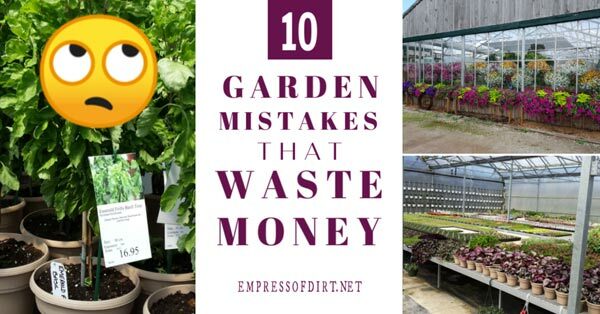 We’ve all done these things—gardening mistakes, bloopers, or blunders that may be relatively harmless except they waste money. And, if you’re like me, you want your garden budget to stretch as far as possible each year so that each new season is the best it can be. See if you have made any of these mistakes (I have!) and better yet, perhaps you can avoid them. If you are aiming for a long-term, vibrant garden and funds are limited, it can mean giving up some short-term flowering bling for long-term ka-bloom! There’s nothing like some good, old spring-fever to get us buying way more plants than we have room for. Or sometimes we have the garden space but no time to plant them. Before loading up the cart ask, am I going to be able to plant all of this? And, is there room—with the right space, light, and growing conditions—in my garden? Or, can I even fit all these in the car? And, do I really need them? There’s no sense planting good plants in poor quality soil. Improve your soil each season with natural enrichers like compost to give your plants a healthy foundation. A proper laboratory soil test where they analyze the composition of your soil, the pH level, and make specific recommendations for amending it may also be worth the investment. Every growing zone is a bit different, and no two gardens offer the same growing conditions. Climate, sun, water, wind, and soil may all be different, benefiting certain plants and not supporting others. Even if you find plants at a local garden nursery, do not assume they are suitable for your garden. Check the tag for zone information and best growing conditions and consider whether your growing space is a match. Also learn about invasive and tender plants. Anything that requires too much pampering or overtakes your garden is (obviously) not worth it. I’ve listed some helpful plant databases and resources here. Oh, but they’re so pretty! Yes, they are. Annuals can be irresistible with all those gorgeous colors and textures and instant gratification. But using up your budget on single-season plants doesn’t help with the goal of a creating a long-term, sustainable garden. If your budget is tight and you want a long-lasting garden, focus on perennials (plants that last many years). And sneak just a few annuals in. Also learn how to over-winter tender plants like these geraniums (Pelargoniums) so you can enjoy them next year too. Choose plants suitable for your growing zone. Build good soil. This is an ongoing process. Plant with the mature plant in mind, planning for space, light, water needs. Grow what you love so you’ll be inclined to pay attention and give the plants what they need. Garden organically: all those sprays, poisons, and synthetic fertilizers ultimately work against nature. Follow nature—it knows a thing or two about how to grow things. I’ve been there! You want that beautiful garden and you want it now. 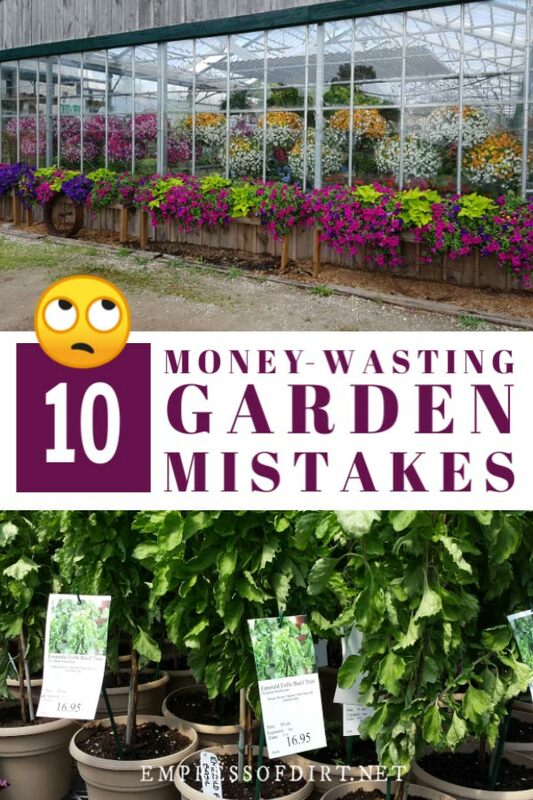 But the reality is, everyone has a budget and if yours doesn’t allow for large, expensive plants to move things along quickly, you are going to have to be patient. Buy younger plants and start others from seed. Within in a couple of years, you’ll be amazed how much they have grown. Instead of buying commercial fertilizers, use your own compost and leaf mold (leaves that have disintegrated) to enrich the garden. Leaves are incredibly valuable in the garden: don’t send them away! Instead of using tap water, harvest your own with rain barrels if it’s legal in your area. Here’s a tutorial on making your own rain barrel. Capturing household grey water is another option. If you really want to stretch that budget, get smarter with your shopping. Instead of buying new at a retail shop, check out used or discounted items at thrift shops, yard sales, online ads, auctions, and shops. Sometimes you can even barter or get things free simply by asking around. Shopping at the start of gardening season is often a money-burner. It takes some sleuthing to find deals but, once you know where to find them, you’ll never turn back. Watch and wait for shop sales, garden club plant sales and swaps, and end of season discounts. Joining a local Horticultural Society or Garden Club can provide a wealth of information, tips on where to get stuff cheap, and some offer discount cards for local vendors. When buying items like seeds and bulbs that often come in bulk, consider combining purchases to save on shipping and share with a friend. If you’re buying compost, manure, or mulch, do the math and see if you’re better off getting a truck load delivered instead of buying bags, or, perhaps you can split an order with a friend. Also, making time to properly care for garden tools means they can last a lifetime. I am a big fan of vegetable plants simply for their beauty, but, if you are really trying to make the most of your money (and garden), don’t grow veggies you don’t want to eat or cannot donate. Focus on veggies you love but cannot get dirt cheap at the Farmer’s Market. Unusual heritage vegetables are a great place to start. How to Improve Your Garden Instantly Without Spending a Dime | Sometimes you just need a fresh way of looking at things to improve your garden. 10 Smart & Frugal Garden Hacks | This is my preferred way to solve problems: use what we have! 24 Clever Garden Problem-Solvers Using Household Items | These won’t change your life, but you may find some of them to be helpful. 48 Smart Money-Saving Garden Ideas | I love how thrift and organic gardening go hand-in-hand. How to Create a Dream Garden on a Low Budget | When I started out, I could spend $100 a year on the garden. And yes, I made it stretch!